Seventy jobs are to be created at a Devon tourist attraction which has been leased to a private company. 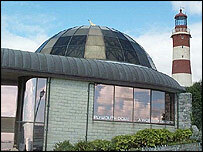 Plymouth Dome, which opened 18 years ago, was being subsidised by the city council to the tune of £200,000 a year and suffering falling visitor numbers. The council is to keep the freehold and about £750,000 is to be invested by the Wykeham Group. The group plans to run a restaurant alongside refurbished exhibitions put on in partnership with the city museum. The city council said the partnership would help Plymouth continue to celebrate its rich history and heritage. The Wykeham Group said it hoped to continue the evolution of one of the city's important visitor attractions.